HARTFORD, Conn. - A University of Connecticut researcher known for his work on the benefits of red wine to heart health falsified his data in more than 100 instances, and nearly a dozen scientific journals are being warned of the potential problems after publishing his studies in recent years, officials said Wednesday. UConn officials said their internal review found 145 instances over seven years in which Dr. Dipak Das fabricated and falsified data, and the U.S. Office of Research Integrity has launched an independent investigation of his work. 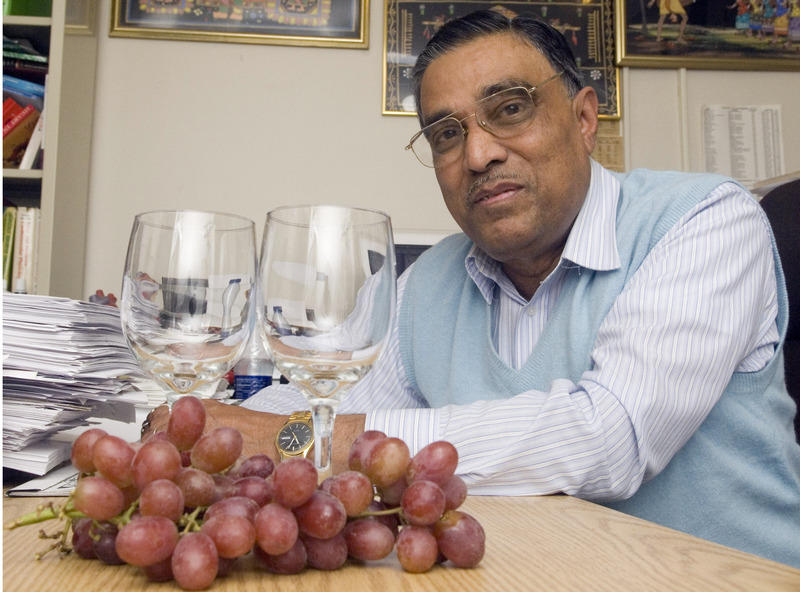 Das, a tenured surgery professor and director of UConn Health Center's Cardiovascular Research Center, has gained national attention in recent years for research into the beneficial properties of resveratrol, which is found in red wine. UConn officials did not say Wednesday whether the falsification occurred in research on that topic or others. The university's health center recently declined to accept $890,000 in federal grants awarded to him as its review was under way, and has frozen all other external funding for his lab. Dismissal proceedings have also been launched against Das, who has been employed by the Health Center since 1984 and was granted tenure in 1993. Das could not immediately be reached Wednesday, and a message was left for the union representing him. Eleven scientific research journals that have published Das' work are being notified of the problems, which came to light after a three-year review sparked by an anonymous complaint in 2008 of potential irregularities in his research. "We have a responsibility to correct the scientific record and inform peer researchers across the country," said Philip Austin, interim vice president for health affairs, said in a written statement about the notifications to the 11 scientific journals. He said the three-year review required considerable time because it had to be exhaustive, and that while they are "deeply disappointed by the flagrant disregard" for UConn's conduct codes, Austin says they are grateful that the anonymous tipster notified authorities. "The abuses in one lab do not reflect the overall performance of the Health Center's biomedical research enterprise, which continues to pursue advances in treatments and cures with the utmost of integrity," Austin said. "We demand full compliance with all research standards and policies by our faculty and staff." The disclosure comes less than a week after Connecticut authorities finalized an agreement with a Maine-based lab to build a genomic research facility at the UConn Health Center in Farmington as part of a broader plan to expand the medical and dental schools and boost research. Das' research pre-dates those plans by several years, and is not directly part of the genomic research program.